If the yel-Low Safety Dolly can be used as a mattress dolly, why come out with another dolly that you call a mattress dolly? 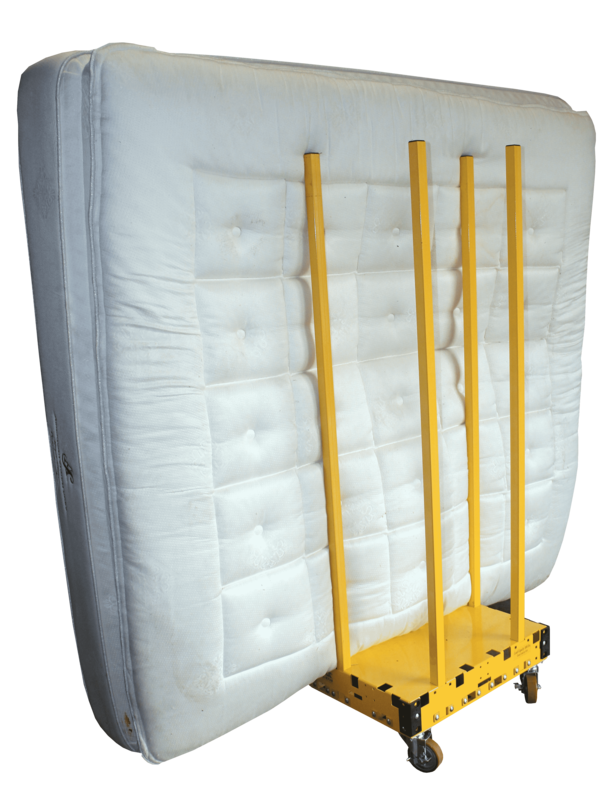 Our standard yel-Low Safety Dolly can carry a standard mattress and box spring. However, not all mattresses are standard. 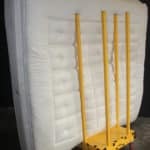 We have been working with a lot of renovation companies that haul off old mattress sets and bring in new mattress sets. 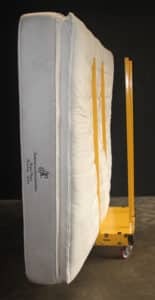 With the standard yel-Low Dolly, only the pillow top can be carried without the box. 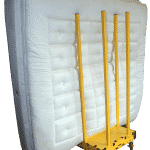 With the new Mattress Dolly Deluxe, the pillow top mattress along with the box springs can be moved at one time saving trips. 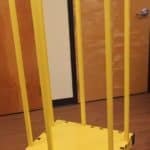 This is done by adding 4 more vertical post positions totaling 18. 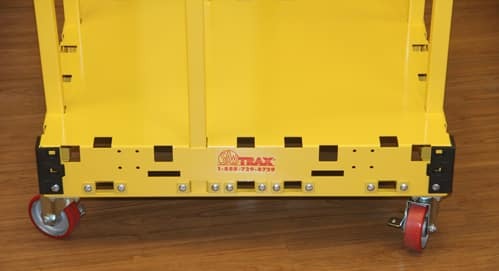 The Deluxe dolly comes with corner bumpers so that accidental bumps into walls are not a problem, longer posts than the standard safety dolly and the “high\low” option for having the dolly be low to the ground for easy loading or having a higher clearance for moving over uneven surfaces. 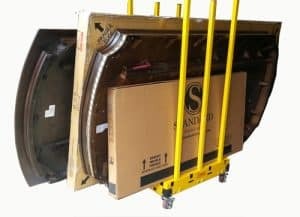 The low version is great for moving king sets through a doorway. 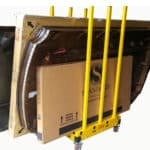 The high option is great for going outside into a parking lot or other uneven surfaces. 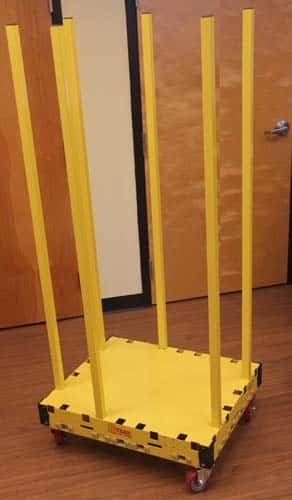 The box is similar to the yel-Low Safety dolly (25″ by 30″) but with 4 more post positions that allow for 16.25″ & 9.25″ gaps instead of an even gap of 12.75″ in the 30″ width direction. 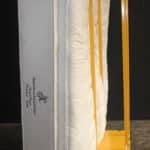 This gap allows one to easily carry a pillow top mattress along with a box spring. The longer post allow for greater capacity and makes carrying king sets much easier. 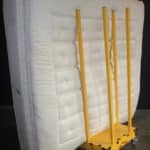 Posts can be used vertically and horizontally so a foam mattress can be supported with horizontal posts while braced with the vertical posts. 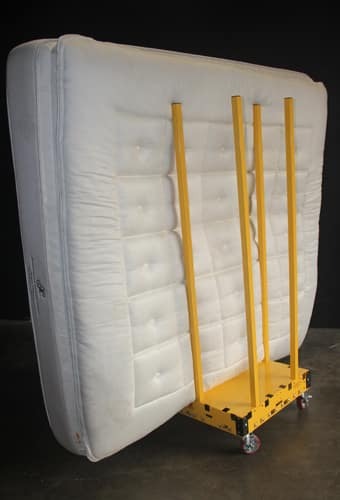 18 Vertical post positions instead of 14 of the yel-Low Safety dolly so you can carry a pillow top mattress and a box spring at the same time. 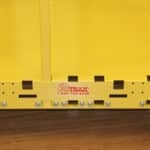 Longer posts are used for greater capacity and for carrying King sets easier. 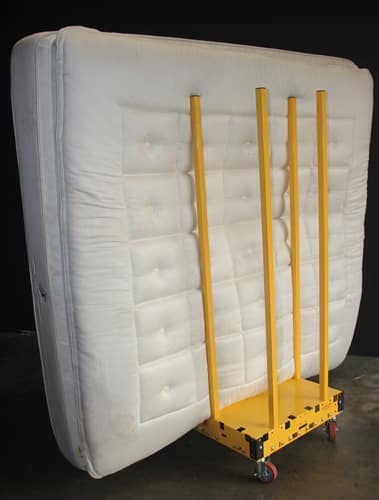 High or Low upgrade like the Raised Safety Dolly allows the user to have greater ground clearance for taking outside over uneven surfaces or making it a low box height of 5.25″ for easy loading or taking king mattresses through a doorway. 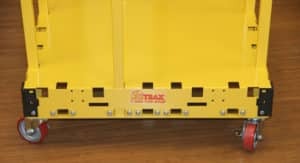 New Corners Protectors are standard so accidental contact into walls do not leave marks. 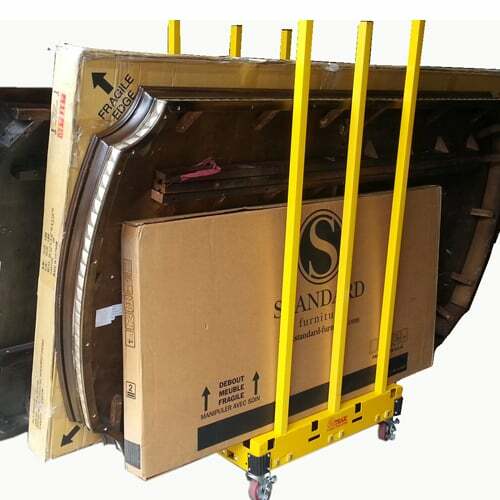 Same flexibility of use as the standard yel-Low Safety Dolly but with added capability.